Memorial Sloan Kettering’s new $300 million cancer center in New York focuses on the well-being of the patient—even as they move you through the process as quickly as possible. Inside the nearly-finished Josie Robertson Surgery Center (JRSC), the waiting room feels more like a fancy co-working space for families to camp out, play games, get work done, and grab a bite to eat. 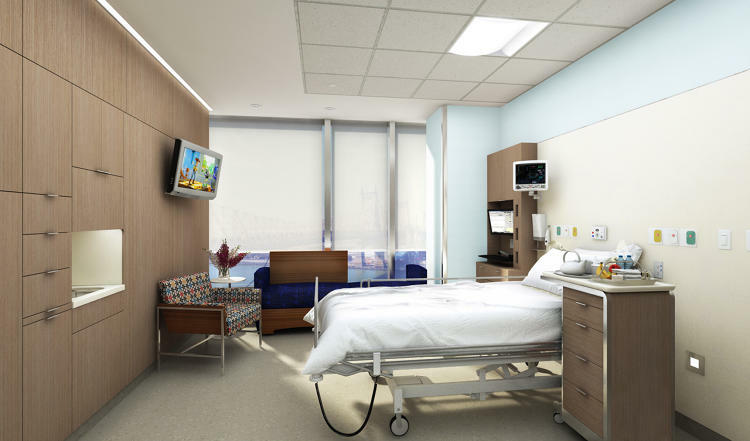 The patient rooms—all private, with private bathrooms—have floor-to-ceiling windows; the floors have unique art and poetry, central gathering places for a buffet breakfast and socializing; the figure-eight hallways double as walking paths for post-surgery exercise. Even the 550-person staff will get a well-thought out space that goes far beyond the usual hospital cafeteria. If cancer wasn’t involved, it’s a place you could imagine wanting to hang out.